This is not the first year that Goodwood Park Hotel is offering a mouth-watering array of novel durian delights. While I have tried its signature Durian Mousse Cake before (and was not impressed), was enticed enough by the instagram-worthy Durian Rainbow Ice Cream Cake that my dining companion and I dropped by recently. 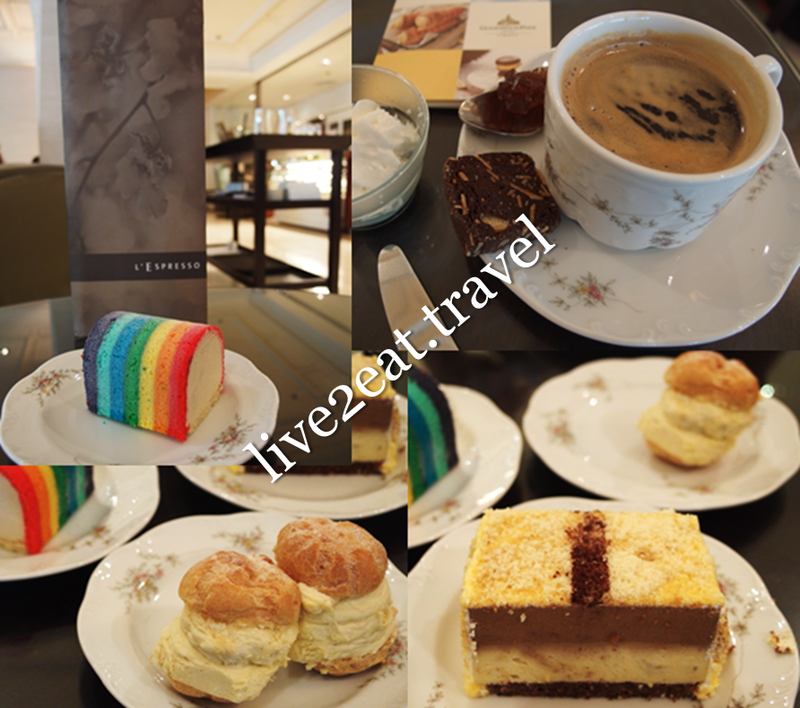 We ordered that, a slice of Durian Cappuccino Cake and two pieces of its signature Durian Puffs. Durian Rainbow Ice Cream Cake was made up of durian ice-cream wrapped with a thin slice of dry rainbow cake that looked better than it tasted. I have had better durian ice-cream and rainbow cake. As much as I love both coffee and durian, could not discern the former in Durian Cappuccino Cake unless the layers are eaten separately. Am not a fan of profiteroles and these Durian Puffs were good but not enough to change my mind on that. Also had Hazelnut Coffee, which was interesting and came with chocolate almond cookie, at L'Espresso.